The EOS M5 is the latest addition to Canon’s expanding range of mirrorless models, and is the most enthusiast-oriented to date. 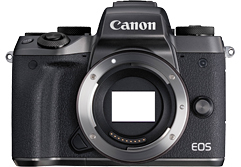 It features a 24MP APS-C-format CMOS sensor with Dual Pixel AF across 80% of the frame, first seen on the EOS 70D. Enabling focus tracking during movie capture as well as improved subject acquisition in stills during Live View, this sensor-based phase detection technology is being rolled out across Canon’s lineup, including in the Canon EOS 5D Mark IV.